Fans of anime songs and online natives can look forward to a star-studded festival as Anime Festival Asia, the region’s most established experiential festival for Japanese Popular Culture, gave an update on its I LOVE Anisong concert artist line-up, with the additions of artistes who will mostly make their overseas debuts at the festival. In addition, through a new collaboration with niconico, Japan’s largest video sharing website, Anime Festival Asia will set aside a dedicated space for the first niconico KUNIKAIGI to be held outside Japan. “With the hard work put in by the team and partners and the support of our loyal customers and Japan Pop Culture lovers across Asia, we continue to ensure that AFA becomes the platform for World’s 1st Experiences. The anisong music artistes announced will make their first ever music performances outside of Japan. With the support from DWANGO with niconico KUNIKAIGI – Japan Internet Culture Festival – this is also the first time this event will be held overseas. We are extremely excited that AFA will continue this legacy, with other exciting announcements coming up as we move towards AFA 2014 in December,” said Anime Festival Asia’s Executive Festival Director and SOZO’s Founder and Managing Director Shawn Chin. 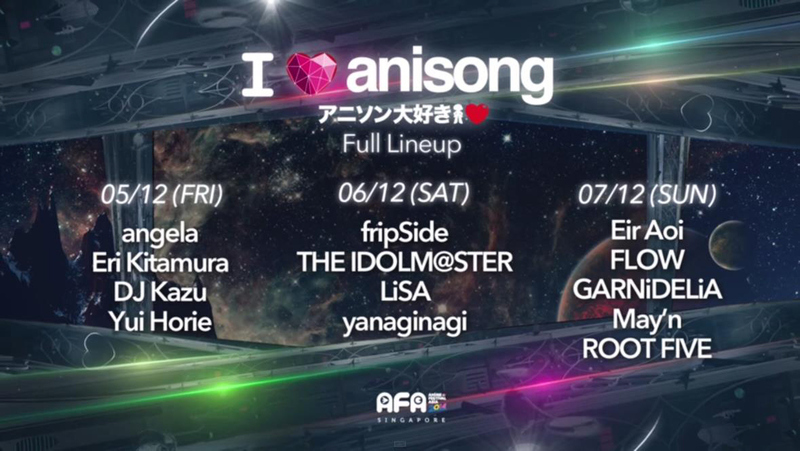 Organisers announced five more artistes, bringing the full line-up to 13 artiste and artiste groups for the AFA 2014 I Love Anisong Mega Anime Music Festival. The highly anticipated artistes will bring anime music fever to a new high, as angela returns to the AFA stage, joined by overseas debuts from IDOLM@STER, Eri Kitamura, ROOT FIVE, and Yui Horie. Early bird tickets for VIP 3-day packages, priced at S$398, are available from October 1, at 12pm, till October 11, 10am, online ticketing via a sub-site for the event, and at selected physical outlets. An area of the festival grounds will be dedicated to Niconico’s off-line event, niconico KUNIKAIGI, as part of a collaboration between Anime Festival Asia and Niconico. With the concept of “Recreating Niconico In Real Life”, Niconico staged niconico CHOKAIGI 3 with great success, garnering roughly 125,000 attendees and 7.8 million online viewers. This experience will be replicated in niconico KUNIKAIGI as well! Attendees will be able to participate in activities and online viewers worldwide can comment real-time, as the real and virtual worlds connect in KUNIKAIGI. Online niconico personalities will also be present in person to meet and interact with the fans. This is the first time the concept has been brought overseas. AFA2014 will be held from 5 to 7 December 2014, at Suntec Singapore Convention and Exhibition Centre Level 4. For more information on the festival, members of the public can check out http://www.animefestival.asia and http://www.facebook.com/animefestivalasia.